I made it to the track at 5:20am this morning. 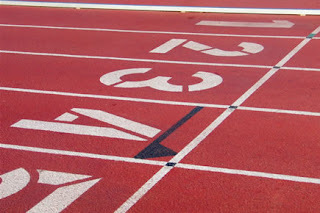 I love track workouts and was ready to get started. I ran my 800 warm up and stretched out. I actually called Coach Greg on the phone to get the first part of the workout (sad...). When I first started running the 200's I did three before Greg showed up and I noticed I had the wrong pace. I slowed down, did two more and nailed my pace. I ran the 400's a little fast and was only able to get in five of the 800's. We finished with a 1600, without looking at our watches (harder than you think). I ran the first half fast, but after making a correction I was right on pace. The whole workout was 6.5 miles. It really did not feel that long. Last night, my son and I drove over to the track while my wife took our dog to obedience school. We walked around and then watched the middle school kids practice football. There were a lot of runners on the track and one group was running repeat miles (I hate those). The cool thing was that along with that group there were other people walking and jogging. It was nice to see so many people just getting out. My son said the best thing after he saw a guy run by that was having a hard time. He said, "he is really trying his hardest and it doesn't matter if he is first".